The following podcasts will help you learn to use "a little," "a few" and "a lot of." This particular podcast presents a set of easy exercises for A2-B1 learners. 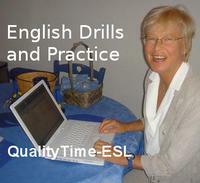 If you want more challenging and complex activities, go to the complete list of QualityTime-ESL Podcasts and look for B2 or C1 levels. If you wish to become good at English, you should work on grammar as it provides you with the equations you need to compose correct sentences. QT-ESL 57 "A Little/A Few/A Lot of"